Safety for children and pets – the major concern for every pool owner was the motivating factor in Meyco’s development of the mesh cover back in 1956. Decades of improvements and four U.S. patents later, Meyco continues to offer an outstanding version of the original mesh safety pool cover. 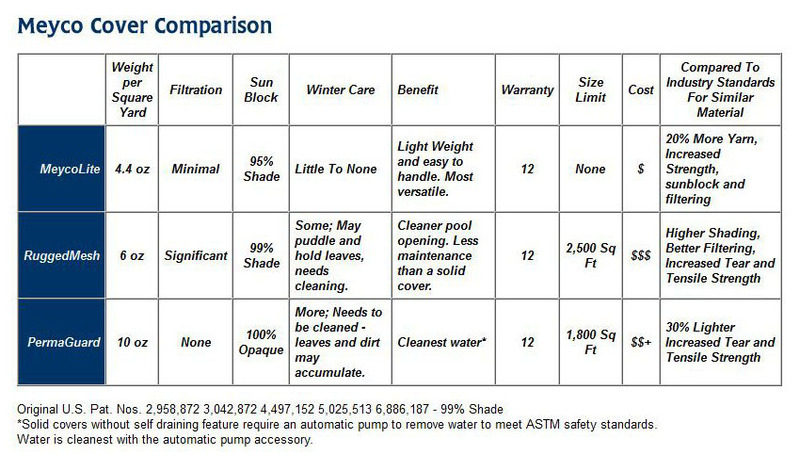 Meyco pool covers exceed all ASTM standards for safety as well. Non-corrosive solid brass anchors disappear flush with the deck when the cover is removed and the need for unsightly ropes, pillows, pumps and water bags is eliminated. When properly secured to the pool decking, the cover’s crisscrossed webbing holds taut across the pool in “trampoline style”. Meyco pool covers are not blown off in a windstorm, are difficult to remove without the safety installation rod, and if that isn’t enough, the straps are capable of withstanding over 4,500 lbs. of tension. 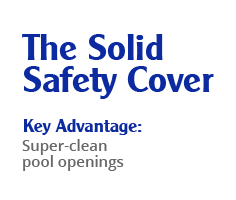 Meyco Pool Covers has long been the leader in swimming pool cover manufacturing. 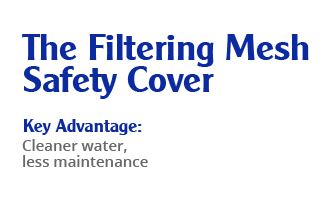 Meyco’s outstanding 12-year warranty is offered as a result of high quality materials and workmanship. Meyco pool covers are built tough and last long. Mesh Safety pool covers eliminate the need to pump off dangerous surface water since rain water drains through. Leaves and debris on the cover dry and blow off. Tailored to fit any size or shape pool, the standard forest green fine mesh is handsome in appearance as well as maintenance free. This pool cover material, since it’s the lightest weight, is used on the world’s largest pool covers. 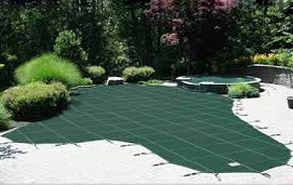 The Meyco RuggedMesh Pool cover is designed to filter out finer particles and block more sunlight. The RuggedMesh Safety Cover is stronger than the MeycoLite, but requires a bit more maintenance while installed. Since the mesh is thicker, extra care must be used to clean the mesh after winter use. “Polygard” Meyco is able to properly cover all pool shapes and sizes, even the most unusual and unique shapes and circumstances (rocks, waterfalls, walls, etc.). The Solid Safety cover was designed to keep the water’s chemicals in the pool longer, keep out the sunlight and keep out finer debris. 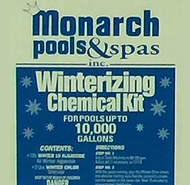 This will allow you to open a very clean pool in the spring. The Solid Safety Pool Cover is heavier in weight and extra care in cleaning may be needed as water collects on the solid cover and debris may stick to the surface.